Entered into force a new law that prohibits the transportation of any liquids in hand Luggage on Board the aircraft. 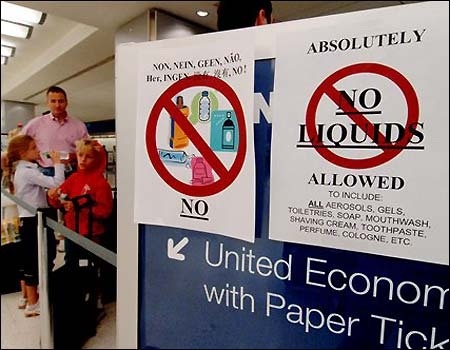 Many tourists who have to make a flight, concerned the issue of the ban on transportation in hand Luggage of all types of liquids. This ban is already in force and will remain in effect until the twentieth of March. This decision by the Federal air transport Agency has taken to provide greater security. Besides coming Olympics, where ensuring the absence of any terrorist attacks - the main prerogative of the authorities. Currently, the aircraft is most vulnerable to the Commission of terrorist acts, so they paid such special attention. It should be noted that all liquids (such as medications and personal care products) the passenger has the right to put in my Luggage. Still, this new rule will not apply to goods bought in duty-free stores duty-free. After all, this is a sterile area, and all products have passed a thorough inspection. The purchased goods are not allowed to open during the flight, enjoy buying tourists will be able after arrival at the destination. In fact, nothing of a supernova in this limitation. Russia even a little behind all over the world, where such a rule has long existed. Russian passengers are encouraged to be sympathetic to such bans. It is, first and foremost, security. Therefore, before departure, be sure to learn the rules of transportation of not only Luggage but also carry-on baggage; and also in due time to arrive at the departure airports.